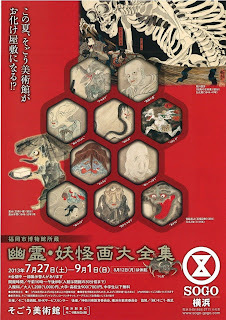 SOGO MUSEUM OF ART exhibition if about 160 works et specter ghost images of ukiyo-e, such as ghost picture scroll. Yūrei (幽霊) are figures in Japanese folklore, analogous to Western legends of ghosts. The name consists of two kanji, 幽 (yū), meaning “faint” or “dim” and 霊 (rei), meaning “soul” or “spirit.” Alternative names include 亡霊 (Bōrei) meaning ruined or departed spirit, 死霊 (Shiryō) meaning dead spirit, or the more encompassing 妖怪 (Yōkai) or お化け (Obake). Yōkai (妖怪, ghost, phantom, strange apparition) are a class of supernatural monsters in Japanese folklore. 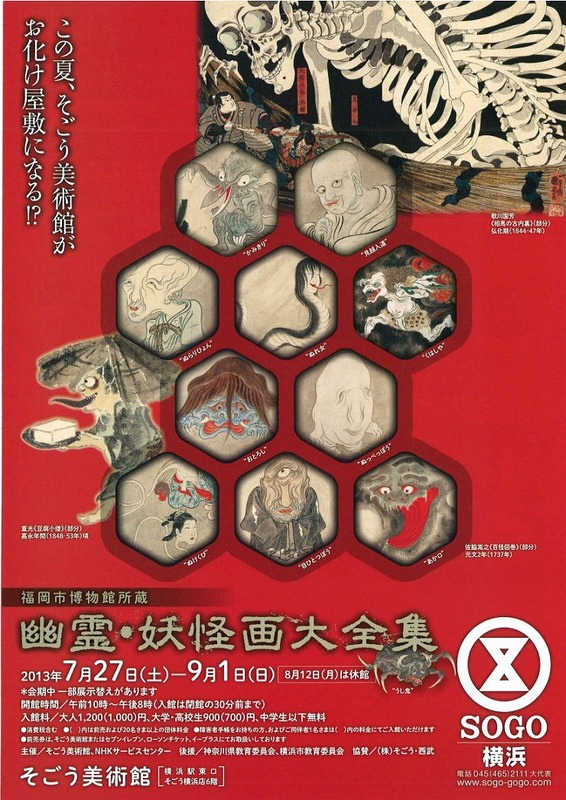 The word yōkai is made up of the kanji for “mysterious” and “weird”. Yōkai range eclectically from the malevolent to the mischievous, or occasionally bring good fortune to those who encounter them. Often they possess animal features (such as the Kappa, which is similar to a turtle, or the Tengu which has wings), other times they can appear mostly human, some look like inanimate objects and others have no discernible shape.